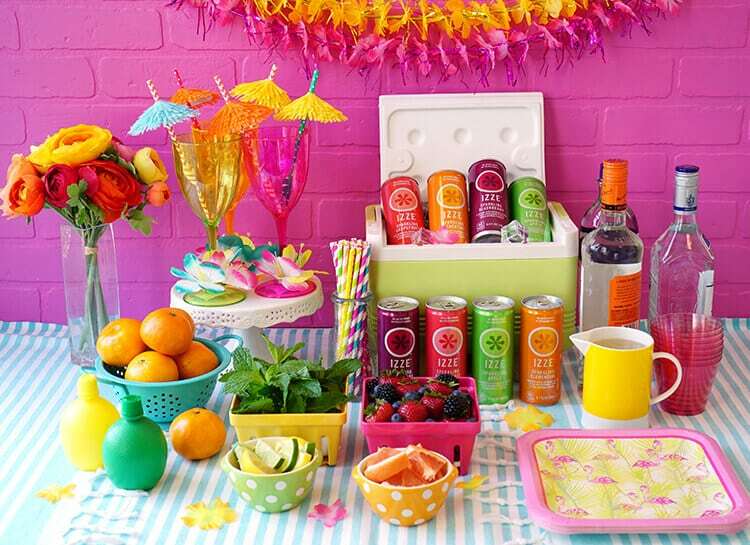 These delicious fruity summer cocktail recipes are perfect for a mix-it-yourself cocktail bar! 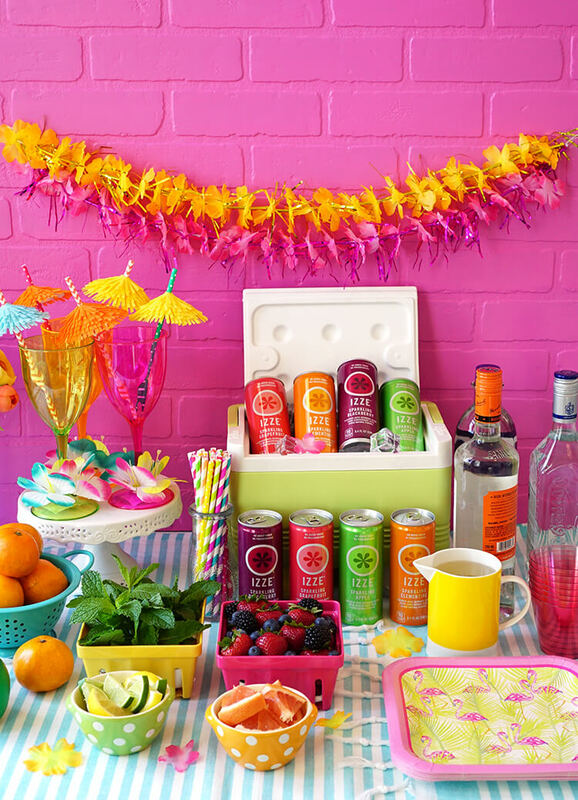 A DIY cocktail station is the perfect conversation starter for parties and gatherings! 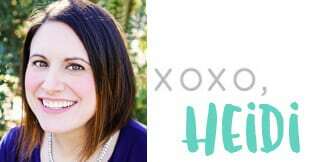 Summer still feels like it’s in full-swing here in Northern California, but back-to-school is just around the corner, and these carefree summer nights have an expiration date that’s quickly approaching. To celebrate one last hurrah of summer, we invited a few of our friends over for a #FriendsdayNight party and do-it-yourself cocktail bar. Mixing drinks together at the bar is always a great conversation starter, so it’s perfect for neighborhood gatherings and block parties. 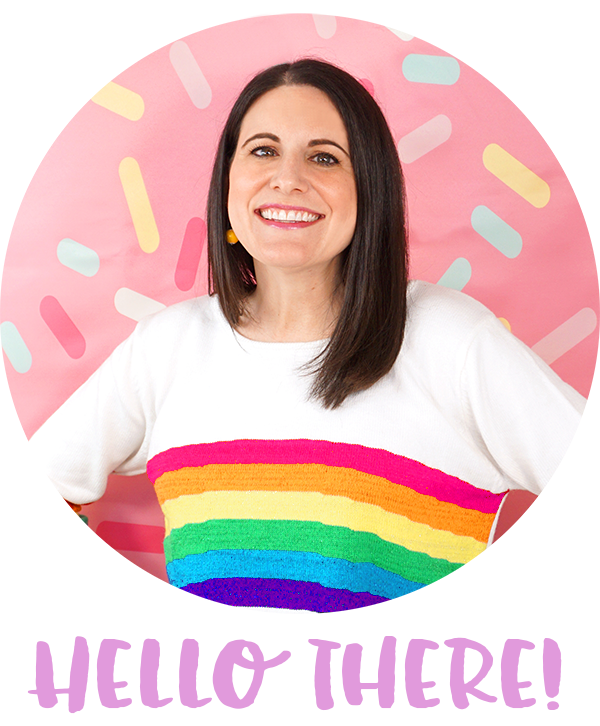 I love getting to know our neighbors! 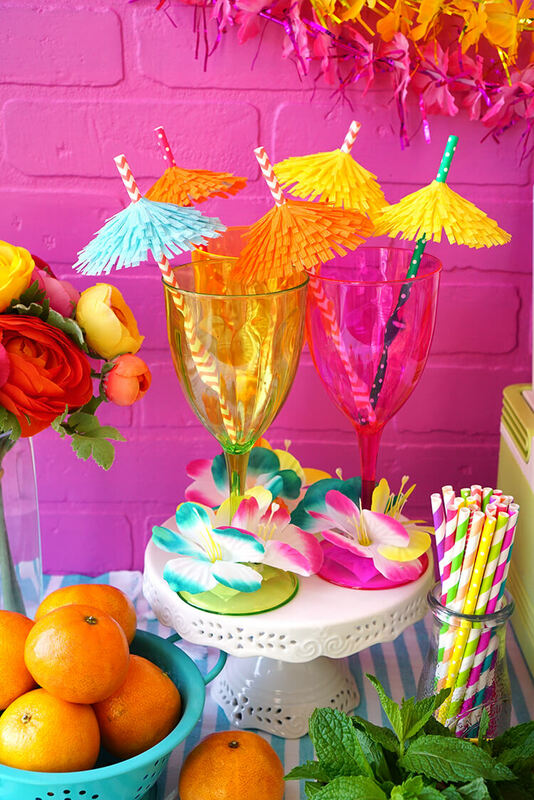 I wanted to make a few fun decorations for our get-together, so I whipped up some colorful tiki drink umbrellas and party straws. 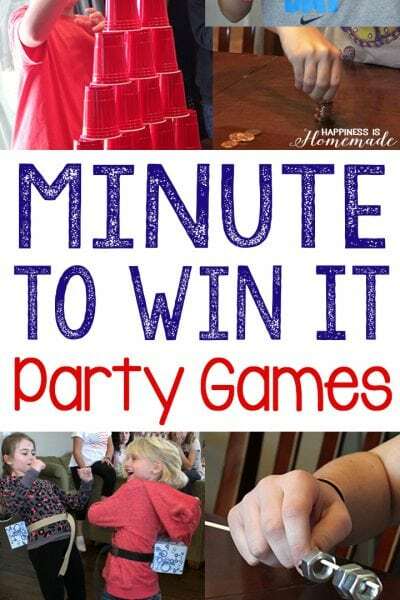 I started with a 3′ length of crepe paper party streamers, and I folded it in half lengthwise. 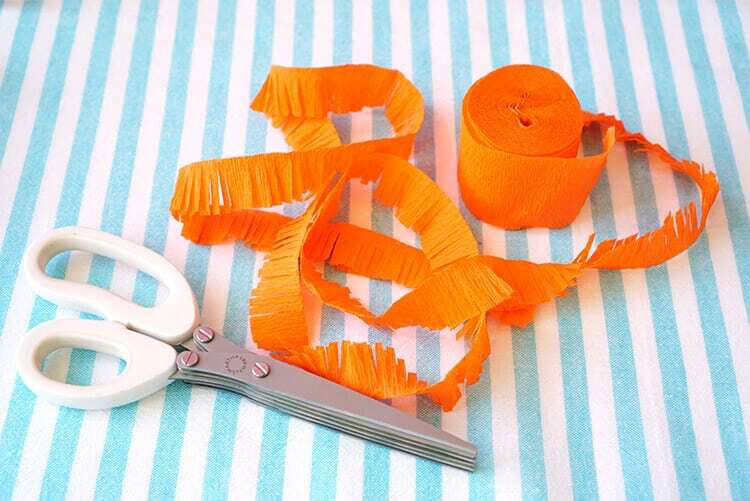 I then used shredding scissors to cut long fringe along the non-folded edge. Cut a circle (approximately 3.5″ in diameter – I traced the mouth of a drinking glass) from a sheet of heavy cardstock. Cut a small pie-shaped piece out of the circle, and use a hole punch to make a hole in the middle of the circle. Use the glue stick to cover the top of the umbrella with glue, and wrap the fringed crepe paper around the umbrella, starting at the bottom and working your way to the top. 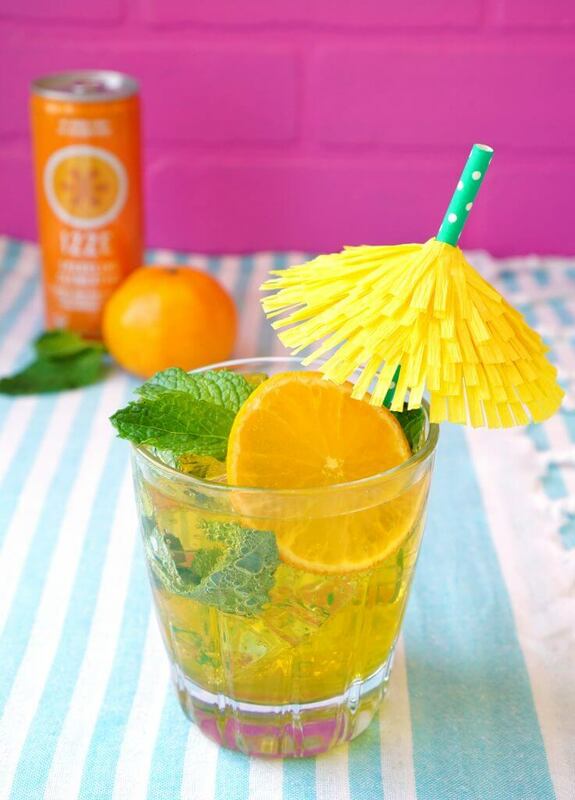 Slip the straw through the hole in the umbrella – easy peasy! 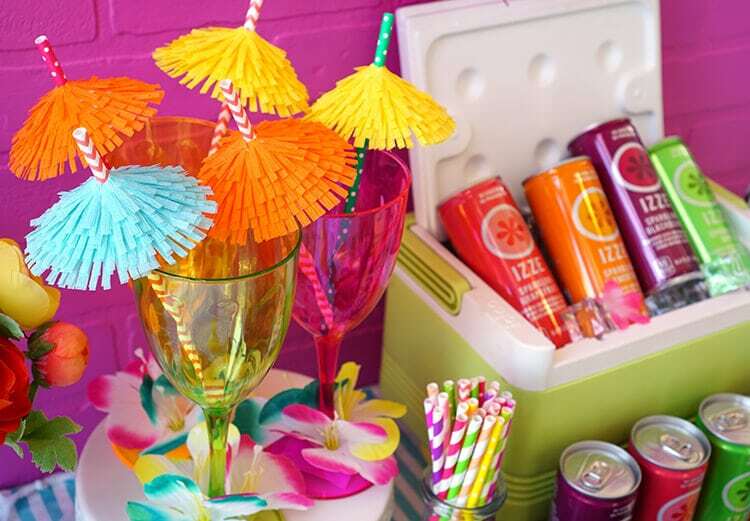 Seriously, aren’t these tiki umbrella straws the cutest?! SO much more personality than your typical drink umbrella! 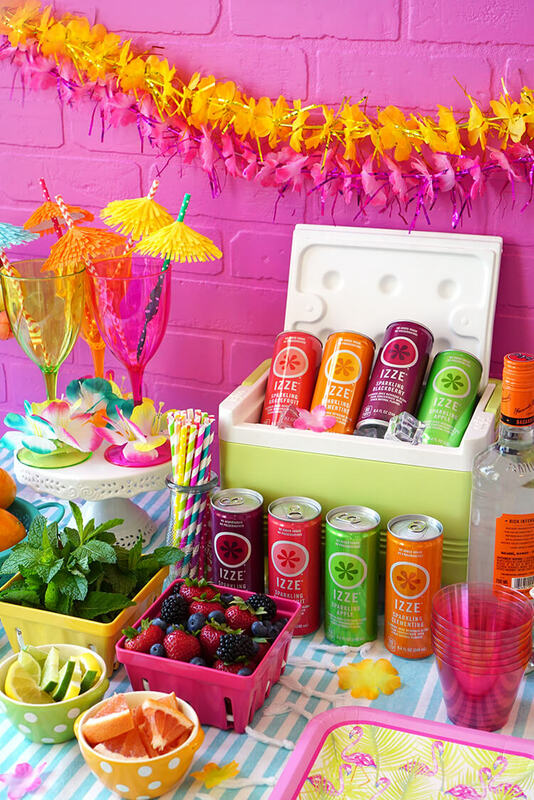 The tiki drink umbrellas are totally adorable, but the real star of our cocktail bar was IZZE Sparkling Juice! 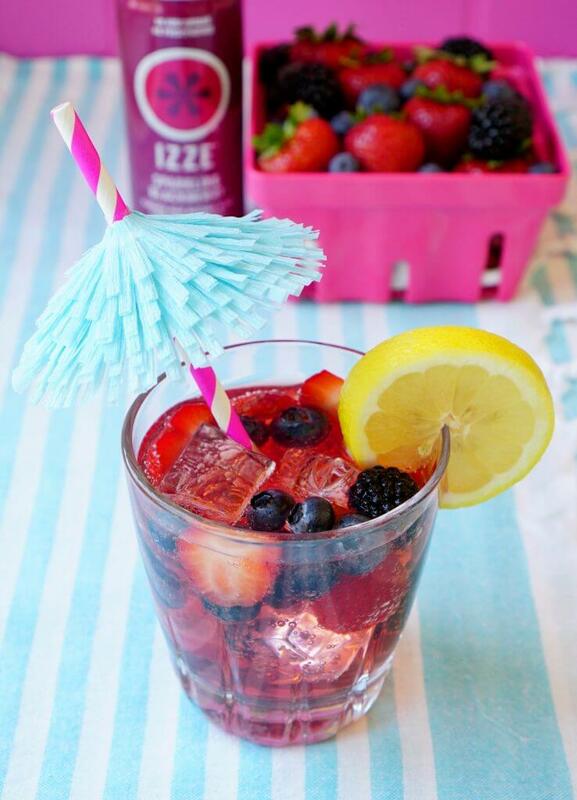 Made with 70 percent fruit juice and a splash of sparkling water, IZZE Sparkling Juice is a better-for-you beverage that’s delicious on its own and also super yummy as the foundation of our fruity cocktail recipes! 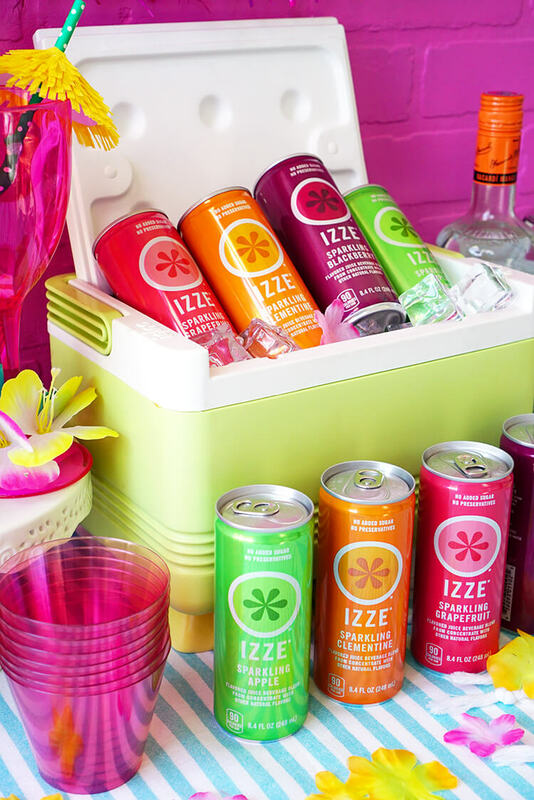 IZZE Sparkling Juice is available in eight fruit forward flavors: Clementine, Grapefruit, Apple, Pomegranate, Blackberry, Cherry Lime, Blueberry, and Peach. 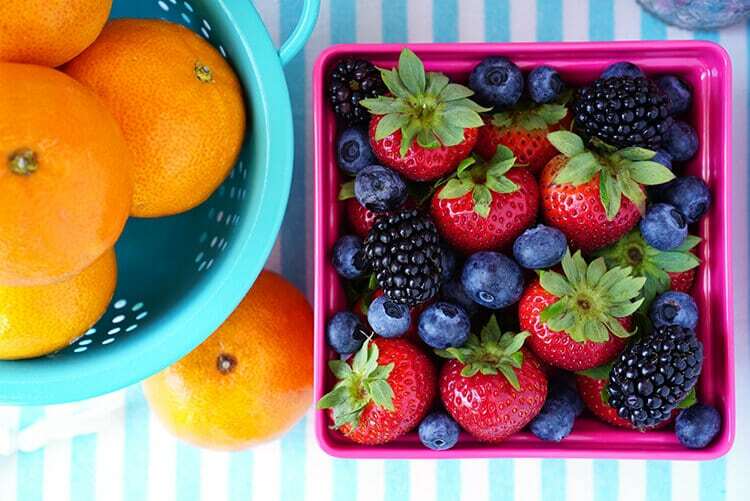 Each and every one of them is seriously amazing, so do yourself a favor and pick up a few flavors the next time you’re at the grocery store! Fresh fruit and herbs also played a prominent role in our cocktail bar – mixed berries, clementines, grapefruit, lemons, limes and mint all made an appearance. 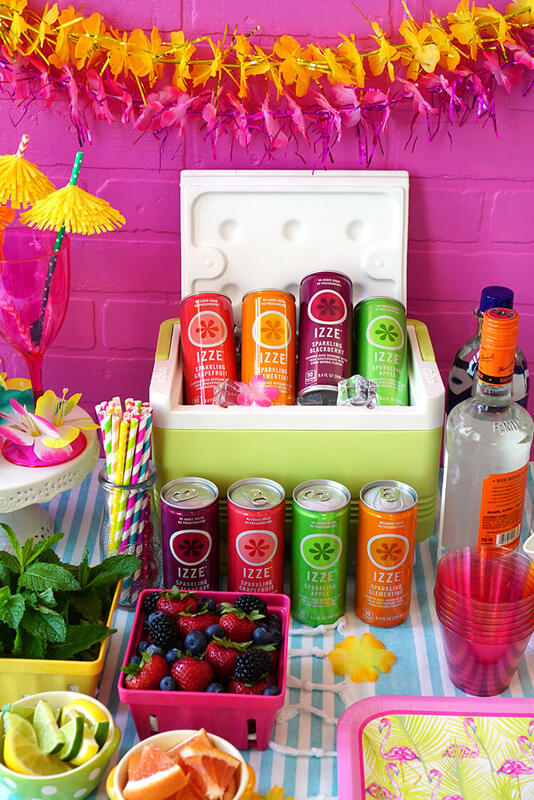 Along with the IZZE Sparkling Juices and fresh fruits, the cocktail bar was also well stocked with vodka, rum, tequila, lemon and lime juice, and a pitcher of simple syrup. 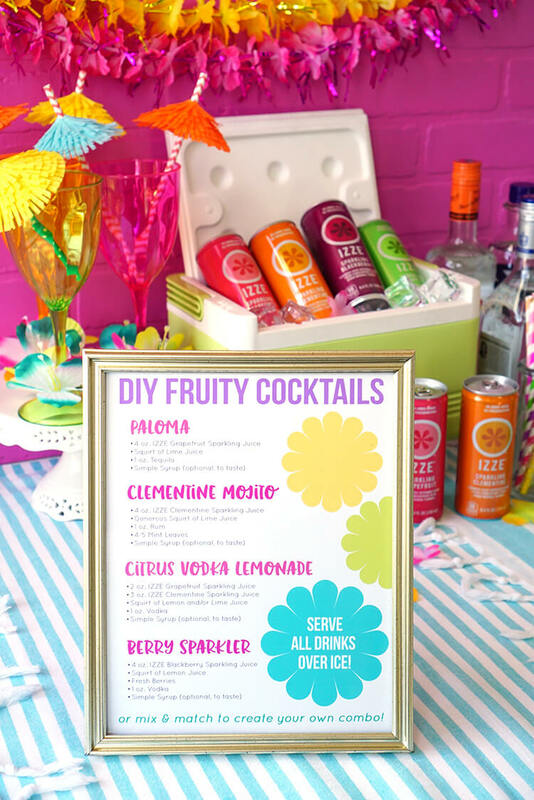 In the center of our DIY cocktail bar was a framed recipe sheet with cocktail suggestions – of course, guests were also free to mix and match the ingredients to come up with their own unique drinks! 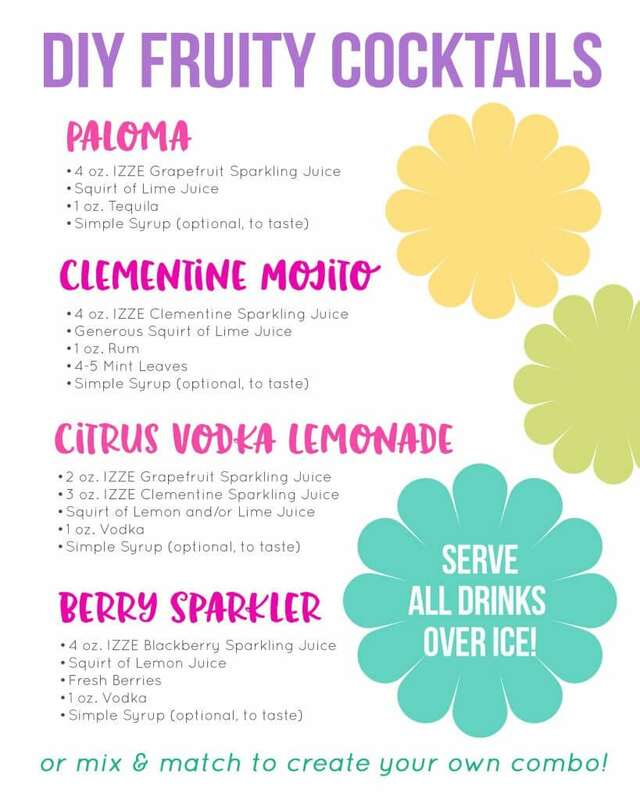 All of our cocktail recipes featured bright IZZE Sparkling Juice, fresh fruits and herbs, high-quality spirits, and a splash of simple syrup (if desired). 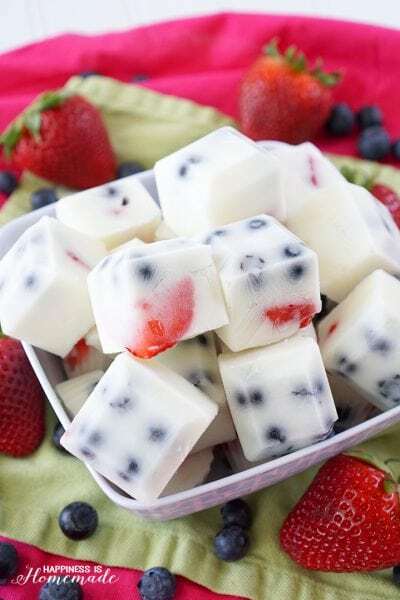 Super easy, and SUPER delish! 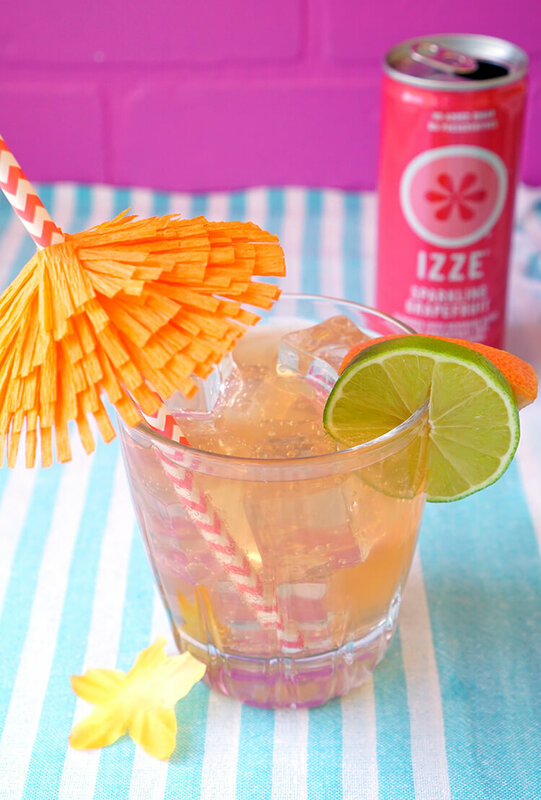 The Paloma includes IZZE Sparkling Grapefruit Juice, lime, tequila, and simple syrup. The Clementine Mojito features IZZE Sparkling Clementine Juice, lime juice, mint leaves, rum, and a splash of simple syrup. 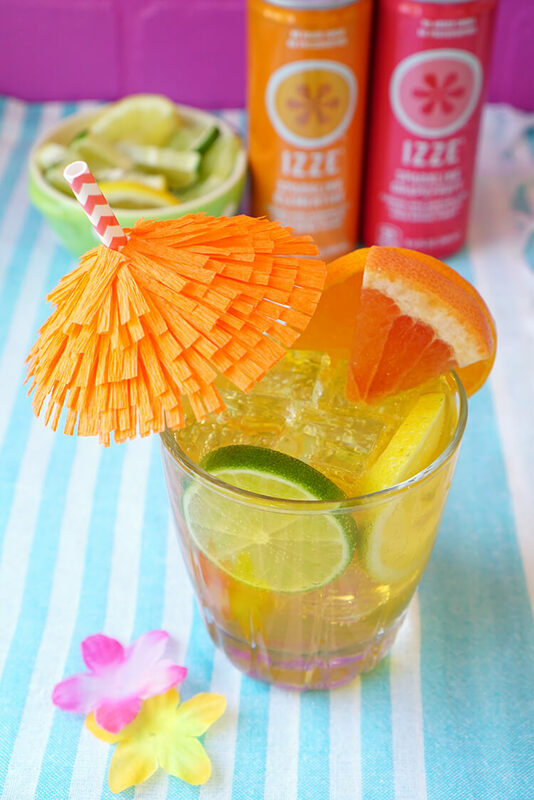 Citrus Vodka Lemonade combines IZZE Sparkling Juices in Grapefruit and Clementine along with lime juice, lemon juice, simple syrup, and vodka. 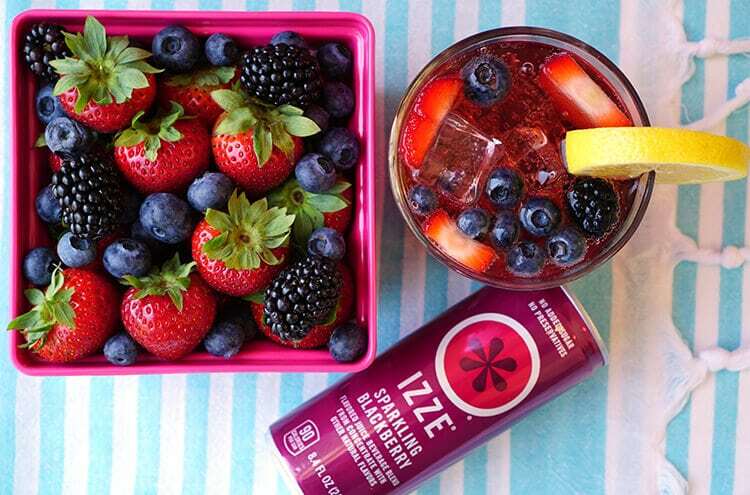 The Berry Sparkler is a mixture of IZZE Sparkling Blackberry Juice, muddled fresh berries, a dash of lemon juice, simple syrup, and vodka (or alcohol of choice – this Berry Sparkler works well with both rum and tequila, too!). 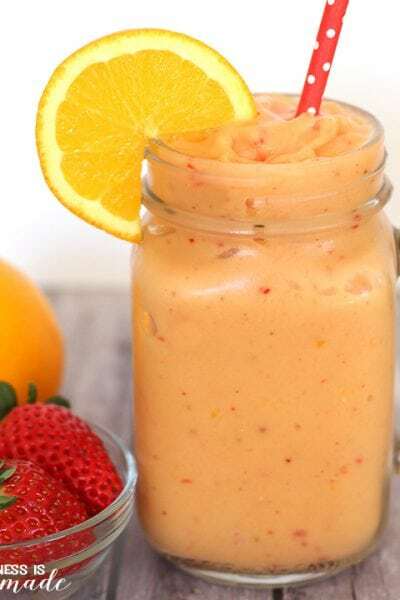 The kiddos went crazy over a non-alcoholic version of the Berry Sparkler as well – YUM! 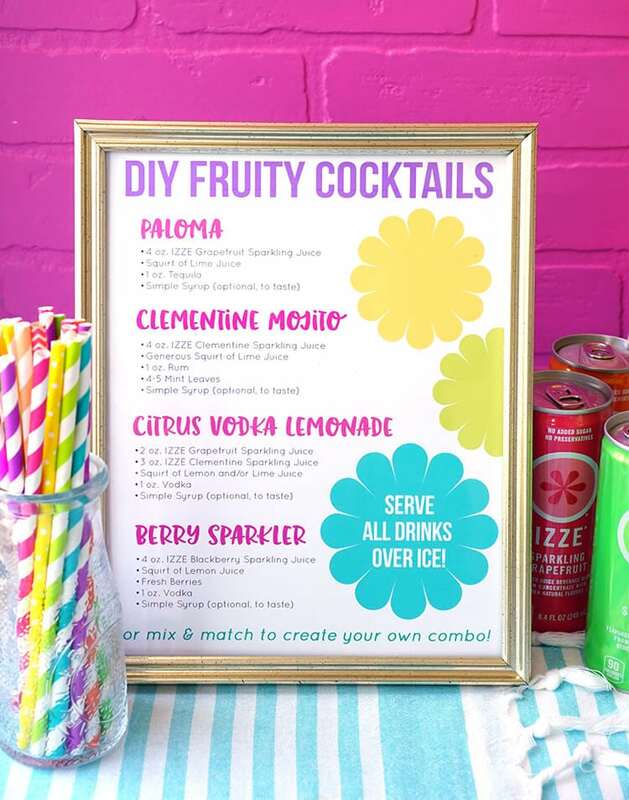 This DIY cocktail station was the perfect addition to our end-of-summer soiree, and it was a huge hit with everyone at our #FriendsdayNight party! 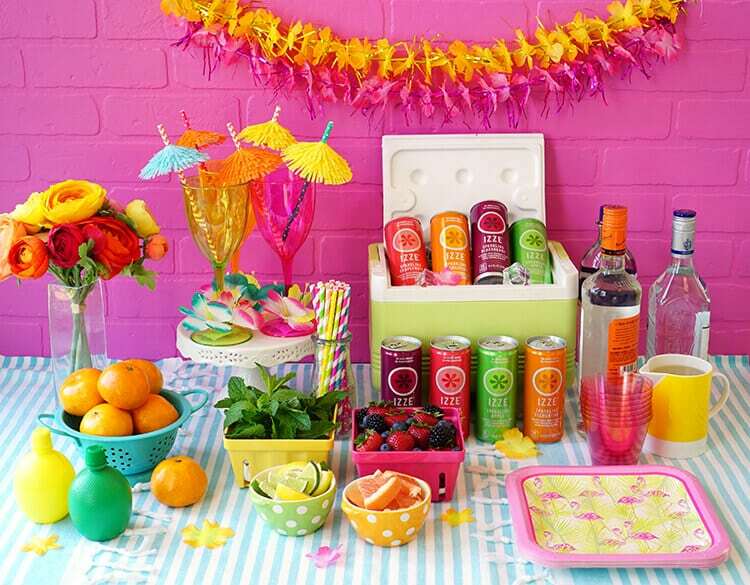 I will definitely be exploring more make-your-own-drink bar ideas for future events! 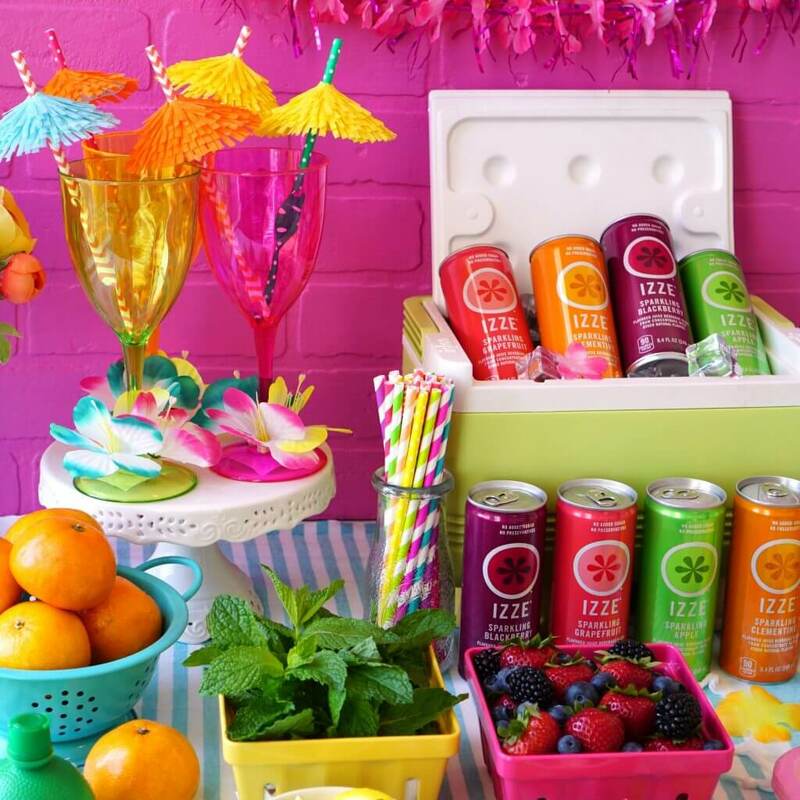 These yummy IZZE Sparkling Juices stole the show at our party, and I know they’re going to be a permanent fixture around here from now on (especially because my boys are hooked on the non-alcoholic Berry Sparkler!). 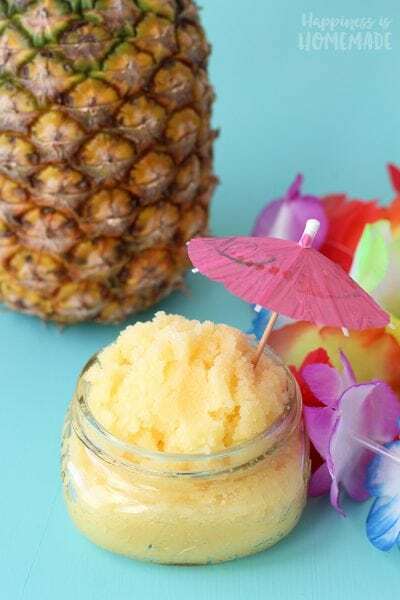 They’re fantastic for backyard BBQs, poolside retreats, picnics in the park, and as part of your favorite cocktail recipe – a true summer staple! Those tiki straw umbrellas and purely awesome!! 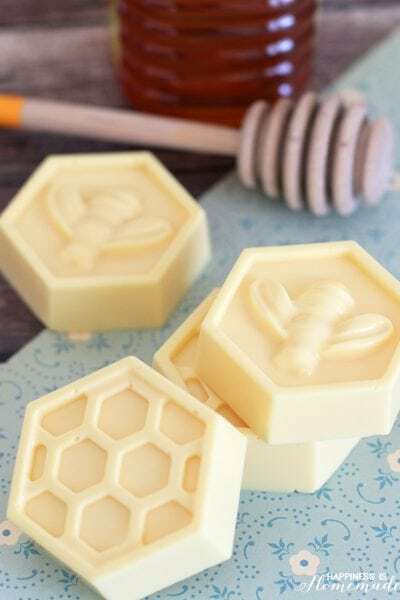 I must make some now! !